Audubon Society’s Christmas Bird Count shows how humans can beat computers in science. The Audubon Christmas Bird Count is a powerful way to collect data and a future model for understanding and responding to environmental issues on Earth. This article originally appeared on Zócalo Public Square. It was just after dawn on Jan. 3, and a freezing wind blew around my binoculars and into my face as I stood scanning a steely Atlantic bay. Suddenly, where there appeared to be nothing but white caps, my eyes sorted out a thin conga line of ducks. Surf scoters have white feathers that make them look like the white tips of waves. Looking for ducks on seawater is like standing in front of one of those mall paintings that hides a 3-D picture of a dolphin. One moment is gibberish; the next is eureka. We were here to count birds—someone counted up to 30 scoters—but we were also pushing our senses and synapses together in hopes of those moments of discovery. By joining the 116th Audubon Christmas Bird Count, I became one of more than 70,000 volunteers from Canada to South America who counted perhaps 70 million birds in the days between Dec. 14 and Jan. 5. (This year’s count isn’t tallied yet.) While most of the world’s important data is gathered by computers, governments, and corporations, the annual bird count—which started in 1900—is artisanal, a labor of love and feathery obsession. As old and personalized as it is, the bird count is a powerful way to collect data and a future model for understanding and responding to environmental issues on Earth—not to mention other planets. I’m not a bird person. I like bugs, trees, and sheep. But finding the scoters in the waves excited me in a way that looking at GPS blips on a screen never could, and I stayed focused through the cold winds over the next five hours as our party of five moved around Maine’s Mere Point, surveying more ducks. We counted 150 common eider, big gorgeous sea ducks whose males have a graphic Z of white feathers. There were also 150 long-tailed ducks, 300 scoters, 40 goldeneye, 15 buffleheads, nine mallards, one red-breasted merganser, two kinds of gulls, 20 Canada geese, and a raft of maybe 900 scaups. We moved around the point trying to get better views of the galaxies of ducks as some dabbled and others dove. This wasn’t just a count of birds; we were mapping the geography of ducks on the water—a duckography of Mere Point. We were guided by Don Hudson, a botanist who has been compiling this area’s count for 35 years, and Ralph, a high school science teacher who’s been doing it almost as long, or maybe longer—he couldn’t remember. They had worked with people who’d done the count for 40 years before them, so they were part of a chain of relationships stretching back to a famous ornithologist who did the count here in 1905. Though the count is typically done by volunteer amateurs, not professional scientists, it has developed levels of expertise and checks and balances that keep it stable over generations. 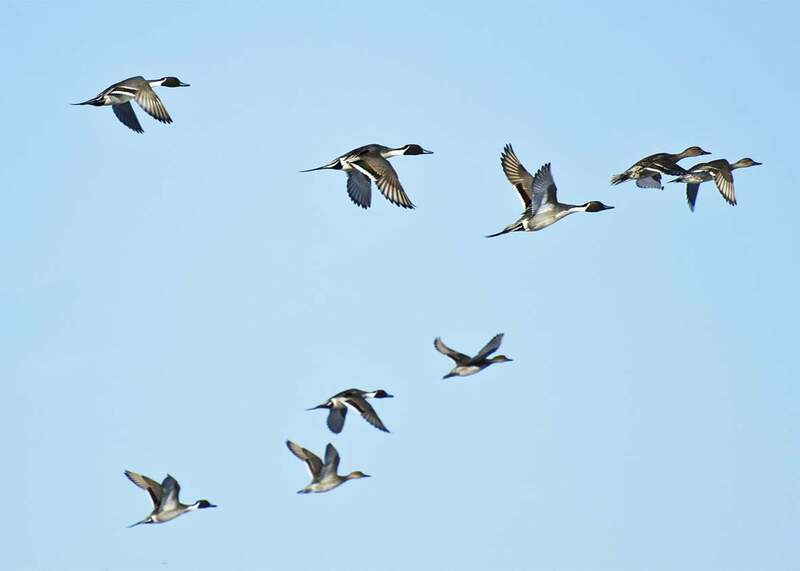 As we spotted more ducks, I realized that despite its age—or maybe because of it—the bird count database ties birds and people and places together across great distances and more than a century. 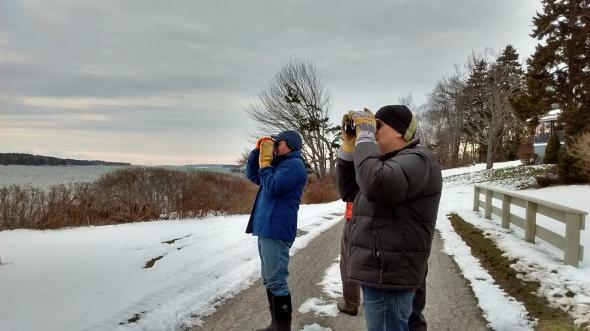 Birdwatchers at the 116th Audubon Christmas Bird Count on Maine’s coast. The bird count has, at its core, concern about birds going extinct, but over the years that’s morphed into surprising political power to stop those extinctions. Passenger pigeons once traveled in flocks so large they clouded out the sun, but by the mid-1890s the flocks were merely hundreds or dozens of birds. The very last passenger pigeon died in 1914. The Audubon Society introduced the count in 1900 as a way to induce people to appreciate birds rather than shoot them on Christmas Day, as was the custom. The count has created a database that has allowed scientists to continue to watch for signs of coming extinctions. A recent report used bird-count data to anticipate how climate change might affect 588 species of birds in North America and found that 314 species are at risk. The count also has a secret weapon: It simultaneously gathers needed data and mobilizes concerned citizens to advocate on behalf of endangered birds. Among the birds that have been counted and saved from extinction are bald eagles, California condors, peregrine falcons, and brown pelicans. Preserving millions of acres of wetlands has doubled populations of wetland birds since the 1960s. We stood in a wooded area on the point counting songbirds such as blue jays, red-breasted nuthatches, goldfinches, red-winged blackbirds—all expected. Then a retiree in a voluminous red coat waved us over to see a real find: a hermit thrush. I had heard its haunting trill over the years, but it takes patience to see its brown plumage among the leaves. Such persistence is surprisingly valuable. University of Washington researchers analyzed more than 300 citizen science projects on biodiversity (like our bird-counting expedition) and found that the work of as many as 2.3 million volunteers amounts to a contribution of about $2.5 billion to biodiversity research every year. In the fall the White House Office of Science and Technology Policy began a push to formalize and expand more such citizen science projects. If you wanted to build a system that can evaluate changes in the climate and respond to them, you couldn’t design a better system than the Christmas bird count with its mixture of birds, data, and gentle fanatics. Computers, you know, don’t have eureka moments. Future Tense is a collaboration among Arizona State University, New America, and Slate. It explores the ways emerging technologies affect society, policy, and culture. To read more, follow us on Twitter and sign up for our weekly newsletter.